Pippa & Drew: We swiped right on a well-known dating app 4 years ago and following a treasure hunt in Budapest which ended with a magical surprise proposal, we knew we wanted a wedding which would be a fun and relaxed that reflected us. We also love vintage/art deco elegance so it felt natural to have this as a theme running through the day. I really hoped to find a dress with vintage glamour and a real wow factor. I was not sure where to start my search but a friend recommended boutique in Wimbledon called Teokath. As soon as I got there I was immediately drawn to a particular designer –Lusan Mandongus. Although it’s a bit of a cliche, it really was the first dress I tried on and I instantly fell in love with it. I knew it was a good sign when my mum cried seeing me step out in it. The dress was exactly the vintage style I was looking for, with incredible beading detail, and the low back and train was breath-taking! To finish off the look I found a jewellery designer in London called Victoria Millesime who makes handmade headpieces from vintage jewellery. I fell in love with a particular headpiece which was made from an antique brooch which really worked well with the dress. The other jewellery worn on the day were gifts, my Grans engagement ring which my mum lent me for the day, and Drew gave me a beautiful pair of Carat London Earrings as a wedding gift. For the shoes, I wanted something with a vintage twist and found some fab shoes from Dune. They were perfect with a great art deco buckle on the front. Sadly Drew’s dad passed away a few years ago, but Drew’s Mum thought it would be lovely for him to use his dad’s wedding ring. We went to the same antique Jewellers in Hatton Garden where Drew bought my stunning engagement ring and they did an amazing job reshaping and sizing it for him. It still has the scratches of age and didn’t lose its character which is what Drew wanted. They also made a gold band so it fits perfectly with my vintage engagement ring. Finding a perfect suit for Drew and the best men was quite hard. He didn’t want anything too plain or business like so finding something that fit the bill was tricky. After exhausting the high street, we came across the website for Marc Darcy which had a great range of suits with contemporary style. Drew and the best men opted for a slim fit three-piece in navy blue with some coloured detail on the pockets which looked awesome! He finished it off with his Grandfathers silver pocket watch which our dear watchmaker friend Lucy (tick tock) kindly restored for the big day. A pocket square from Reiss which complemented his pink tie finished off the look. Having our friends and family together for the whole weekend was important to us, as we knew the wedding day itself would fly by. So we looked for venues which we could hire for the weekend and visited several before coming across and Dewsall Court in Hereford. The grounds and house were so stunning. It had the wow factor but with a relaxed and quirky feel – exactly what we were looking for. The staff made us feel so welcome, especially our event organiser Laura who was absolutely amazing! She really did go above and beyond before and on the day of the wedding to make sure everything went smoothly. She welcomed our ideas and had so many great tips for us! As the wedding was in Spring we wanted to keep the colours light, but we wanted to have some deeper tones running through. So we opted for purples and blues as the base colours for the wedding. We found Julia Eastwood through Not On The High Street, we really loved her foliage designs so got in touch with her about creating a bespoke wedding stationery based on the colour scheme. She was wonderful and after a number of drafts we came up with our designs using wild spring foliage in purple and blue shades for the stationery which we really loved. We did most of the décor ourselves, using some vintage touches throughout. We found and fixed up an old antique drinks trolley to use as a prosecco bar and a large gold gilt mirror on which we had a vinyl order of the day. We wanted the wedding breakfast to have a real elegance so we had it set up as feasting tables and had mix match vintage china and candelabras from Dewsall Court which looked amazing. For the favours my parents had been making Sloe Gin and rum for years, so they kindly gave us some 12-year-old gin and rum. They said they had been saving it for a special occasion and loved sharing it with the wedding party. It went down a storm! We also hired Alfie The Black Cab Photo Booth – as we both live in London we wanted to have a touch of the city on the day so having a black cab turn up was a lovely touch. We wanted to make a statement with the floral design to provide some visual impact on the day, whilst keeping a natural style with an abundance of foliage without too much structure. When we saw the incredible floral installations of Juliet Glaves we knew we needed her to style our wedding. She has the most amazing talent and grows her own flowers on her farm in Shropshire. We discussed ideas and the style we were looking for and she came up with the most incredible Freestanding arch as a centre point for the ceremony but also for the top table in the evening. She really celebrated the stunning spring flowers. 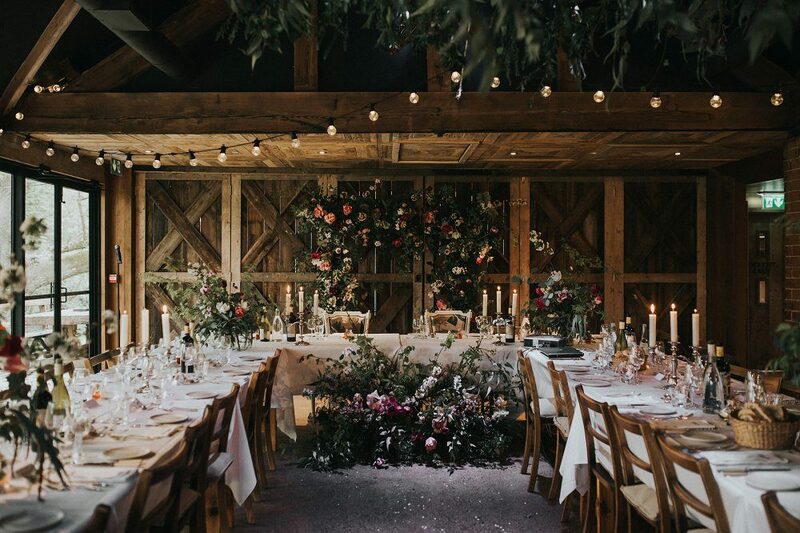 She also hung beautiful foliage including eucalyptus from the beams and chandeliers to frame the Aisle, along with flowers trailing down the aisle. The smell walking into the barn was amazing. For the wedding breakfast, she created large overflowing centerpieces for the long feasting tables which lead to a large display at the top table. I knew she would make it look amazing but it was above and beyond our expectations and our guests were blown away. For the Bridal bouquet, the only thing I said to Juliet was big bold but elegant, and she really got the brief. Drew also wanted a fab statement buttonhole and what Juliet created was awesome, each of the groomsmen’s were slightly different but tying in perfectly with the bridal bouquets and wedding flowers. I had a real nightmare trying to find bridesmaid dresses – I really wanted the colours to match and compliment the colours of the day, and trying to find the right lilac/purple colours, in a style that my lovely ladies would like was a real challenge. Finally, after literally looking for over a year, I stumbled across Victoria Lou bridal which made fabulous multi-way dresses in loads of different colours. I asked for some samples and after so many disappointments I wasn’t holding out much hope. But the colours were perfect!! They were simple and stylish and really brought the colour scheme together and a real plus the bridesmaids loved them. We really wanted the ceremony to reflect us, we wanted it to be poignant, personal but fun. So we decided on a Humanist ceremony, and Dewsall court recommended Chris Edwards. We were absolutely amazing. We worked with him on a draft, of the ceremony tying in both our life stories and making the service fun without taking away the importance of it. We also had a part of the ceremony where we invited any guests to stand up and say a few words in the moment. It could have been a tumbleweed moment but it worked out so well and made it extra special to hear some moving memories and thoughts from our nearest and dearest. My dad walked me down the Aisle to Heartbeats by Jose Gonzales and then my husband and I danced back down the Aisle to Signed, Sealed, Delivered, by Stevie Wonder which was one of my favourite moments of the wedding! We then did the legal side in the old wood-paneled Library room of Dewsall Court – we loved that room so much and wanted to make sure it was part of our big day. We felt a vintage jazz band for the drinks reception would add a great vibe and found this awesome bunch from London. I got in touch with the singer Laura and she was so lovely!! On the day they went down a storm –Laura as a fab voice and the music really added to the style and atmosphere of the day. We’re big food lovers so another draw of Dewsall Court was their amazing menu! Being in the heart of Hereford, we couldn’t not have beef. We had some classic canapés on silver serving trays, with the major hit being the cauliflower croquet’s which people were fighting over! We wanted to have a cool cake, and we were recommended Jacqui by Dewsall, who didn’t disappoint. I sent her some ideas and she came back and made exactly what we wanted! We really wanted some gold in the cake and it turned out great! We had red velvet, lemon and passion fruit on the top layer. It was delicious! We knew choosing the right photographer was an important decision. Luckily a good friend of ours (Paula) is a wedding photographer, and as we wanted her to enjoy the day as a guest we asked her for some recommendations. She immediately mentioned Kerry Diamond, and we are so glad she did. As soon as we saw Kerry’s pictures we knew they would suit our style. She has the most amazing eye for capturing moments and emotions. The tones she uses really compliments the style were we looking to achieve. From the beginning Kerry was wonderful, and on the day she made us feel at ease and we had such a great time with her; it was like hanging out with a friend which is exactly what we wanted. I love your photos! 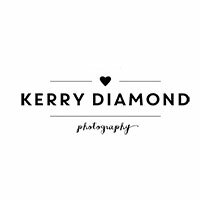 Congrats Kerry Diamond!! What a dream of a location!